BT Vision has ‘successfully’ retained one of the most unwanted honours in the UK TV industry, yet again being named and shamed for having racked up the most complaints out of all Pay TV providers in a new survey on customer satisfaction. The news will come as a blow to BT Vision’s reputation, given that the broadcaster is still something of a David compared to the Goliaths that are BSkyB and Virgin Media. As a relative newcomer to the Pay TV game, BT Vision doesn’t have nearly as many paid-up customers to worry, but even with this light workload it seems that it’s struggling to keep them content. Ofcom’s Telecoms and Pay TV Complaints Q4 (October to December) 2012 report, published last week, reveals that complaints made to the TV watchdog regarding the quality of BT Visions’ service were six times higher than the industry average, with the total number of complaints rising from the previous quarter. 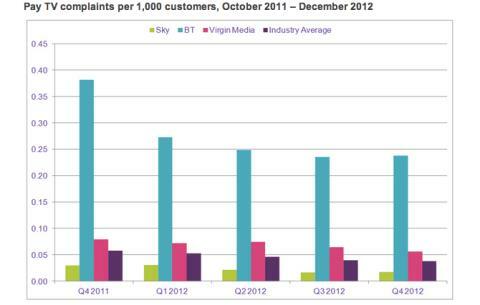 In comparison, both Sky and Virgin Media saw the number of complaints against them fall slightly compared to the previous quarter, although Virgin Media still has a higher volume of naysayers than the industry average. Still, customers might not be happy now but maybe that’ll change in the coming months. With the launch of BT’s new Youview-based service, including the new BT Sport channel set to hit our screens before long, viewers will be able to enjoy a much stronger content offering than before. In addition, the new BT service will only be available to the 13 million homes that can take BT Infinity fibre-based broadband. BT’s fibre broadband connections offer a much more stable streaming experience than their traditional copper-based ASDL counterparts so complaints about service should lessen accordingly. We’re still expecting complaints from those who are unable to receive BT Visions new service of course, especially as they’ll be missing out on the 38 Premier League football games that the broadcaster recently secured rights for. However, with BT’s fibre rollout picking up speed, the number of people able to watch the new-look BT Vision will increase over time. With BT promising to connect up to two thirds of UK viewers in the next couple of years, the broadcaster has every chance of reversing its current standing and becoming one of the more appreciated Pay TV providers around.